Technische Universität München (TUM) has become one of the largest and most notable German institutes of technology since its establishment in 1868. Not only is TUM a university that boasts strong connections with companies and scientific institutions from all over the world, it is also one of the first universities in Germany that was named a University of Excellence. Today, TUM continues its pledge to commit to excellence in research and teaching, and offering quality education to students from all over the world. For more information, visit www.tum.de/en. TUM Asia, the one and only full subsidiary of TUM, was set up in Singapore in 2002 as part of Singapore’s ‘Global Schoolhouse Initiative’, an initiative aimed at developing Singapore into an educational hub with world-class educational institutions. TUM Asia, today, offers 6 Master of Science and 2 Bachelor of Science programmes in Singapore, right in the heart of Asia. Its programmes couple the foundation of German expertise knowledge with case studies from the Asian markets, so that graduates emerge highly relevant to the industries in Singapore and in the region. Most of its programmes are conducted in partnership with top universities in Singapore, the rest fully conferred by TUM. For more information, visit www.tum-asia.edu.sg. 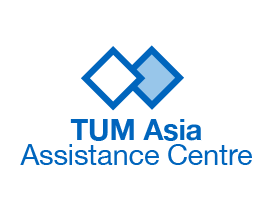 The TUM Asia Assistance Centre was set up with the belief that applicants should not be left alone to manage their university application. Targeting mainly applicants from Asia, the centre aims to assist applicants with their university application to TUM, by offering them advice, recommendations, and suggestions to enhance the quality of their application, therefore increasing their chances of getting into TUM.